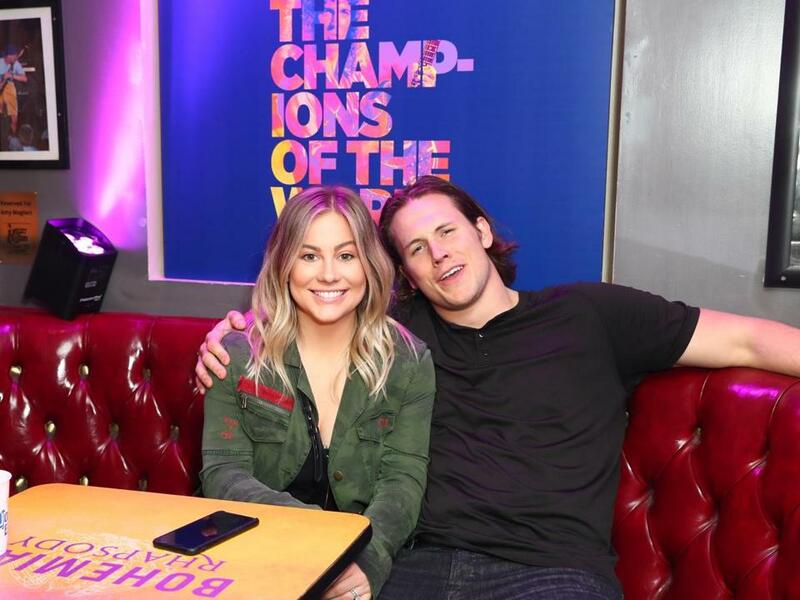 Shawn Johnson and husband Andrew East in Los Angeles in February. Olympic gold medal gymnast Shawn Johnson planned to run the 2019 Boston Marathon along with her husband, Washington Redskins long snapper Andrew East. The duo have excelled in sports that require short bursts of speed rather than long, sustained cardiovascular activity, but both were confident they were up to the task of running 26.2 miles as part of the ClifBar Boston Marathon team. But only East will be running Monday, with Johnson cheering on the sidelines. Fortunately, Johnson’s absence is for a very happy reason — the couple announced on April 4 that they are expecting a child. Johnson chatted about impending motherhood, how marathon training compared to her Olympics training, and why she has been so open about her experience with a miscarriage. Q. First off, congratulations to you and Andrew on your pregnancy. How excited are you? A. We’re really excited. We’re very cautious, as we’ve been through this before, but we’re taking things one day at a time, and are very excited. Q. When you say you’ve been “through this before,” you’re talking about your miscarriage in 2017, which you were very open about in a video on your YouTube channel. Why do you think it’s so important to talk about this topic? A. I feel like facts about pregnancy are such common knowledge to the world — it’s nine months long, you have cravings, this is how it works — but no one talks about miscarriages, even though it’s such a realistic outcome. We posted the video to help ourselves heal, and to ask people about their stories, and it kind of blew up into a big thing. It’s a weirdly taboo topic, but I feel like people should be talking about it more because it’s so common. Q. Does the pregnancy change your plans to run? A. It does change it, yes. I was training and was totally ready to run, but because of my past experience with a miscarriage, my doctors don’t recommend that I run. It’s really unfortunate, but my husband is still running. . . . I’m still really excited about it, but I’ll have to run it another year. Q. How has training for the Marathon compared to your Olympic gymnastics training? A. It’s completely different. It’s the polar opposite of anything I’ve done in my life. My longest gymnastics routine was 90 seconds. And now I’ve been running for hours. Getting on a treadmill and going for a run for an hour or two isn’t necessarily what my body is made to do, but I love it. I have such respect for people who go out and win marathons, who basically go out and sprint for four hours. I’m still trying to figure out how they do that. Q. I imagine it was a similar change for Andrew as well. NFL training camps don’t usually have players run for miles and miles at a time. A. Andrew is technically a lineman, so they’re all about short, quick, and heavy lifting. So even for him it’s been a learning process. He at least comes from an endurance family. His brother is an Olympic cyclist, and Andrew was a cyclist growing up. His dad ran ultramarathons and Ironmans. So they at least have the structure for it. Me? Not so much. Q. What do you have planned for when you’re in Boston? Are you excited to be back? A. We absolutely love Boston. We actually went to the Boston Marathon with ClifBar last year. Obviously the weather was crazy — it was a torrential downpour — but it was so much fun to see the atmosphere. The Boston Marathon is the marathon, and to see Boston just shut down the whole area around the race, and to see the community come out and support it, it’s really cool. Q. You’ve had some Olympic friends with local ties. [Olympic gold medal gymnast] Nastia Liukin lives in the area, and [Olympic gold medal gymnast and Needham native] Aly Raisman gets back here a lot. Are you planning on meeting up with them or any other local friends? A. Nastia and Aly are traveling, so they’ll be at other events. But I have an elementary school friend who was in my wedding, who will be there. My husband’s best friend and cousin are in Boston and will be there. We both have a lot of people we’re connected with in Boston, and they’re all going to come out. It’s going to be fun. Q. I mention Aly because you and Andrew were the ones who set her up with Andrew’s football buddy Colton Underwood, who had himself quite a season on “The Bachelor.” Are you guys happy for him? A. Absolutely. We watched the whole season. Andrew met up with him through the whole time it aired. It was crazy to see someone you know so well go on “The Bachelor,” but it was really cool. Q. What’s your game plan for cheering Andrew on at the race on Monday? A. I plan to be the obnoxious wife to follow him through the whole race. I remember last year, with ClifBar, another friend was running, and they would help me get to literally every mile marker. I plan to do that again with my husband, so he’s going to be so annoyed with me.